My Etsy shop finally got the deep Spring clean it was begging for. I am finally ready to launch my new range of homeware and will release new products between now and later this summer. First addition to my shop is this vibrant pillow cover. It is called Organic Love because it features this huge love heart made of organic like shapes. I am so glad I found a use for my manic doodling and absolutely delighted with the result. Last but not least, I have been working on product picture quality. This was an ongoing concern of mine as I found mastering image manipulation concepts and software very difficult. But I came across a list of tutorials meant for craft business owners via Handmadeology (see part 2 “Product photography”) and was delighted to find answers to all my questions in these few links. So I am now in the process of cleaning and/or remaking all my product pictures. This being said, I am heading to Handmade Monday #121 to chat and see what everybody else has been making. What a lovely cushion. Blue is up the top in my favourite colours. Good for you coming to grips with photography…I need to as well! p.s. my cottage is the white one with 2 red doors! Thanks, great minds are alike: I have tried the design on a tote bag of mine, it is great. I really like that cushion. All those teachers that tell you doodling is a waste of time are so clearly wrong!! Great logo too. Thanks. And yes I have found lately that doodling is great for a lot of things. Hey, the lamp is from Ikea. it looks great but I have to say it is not very easy to get it to keep in position. 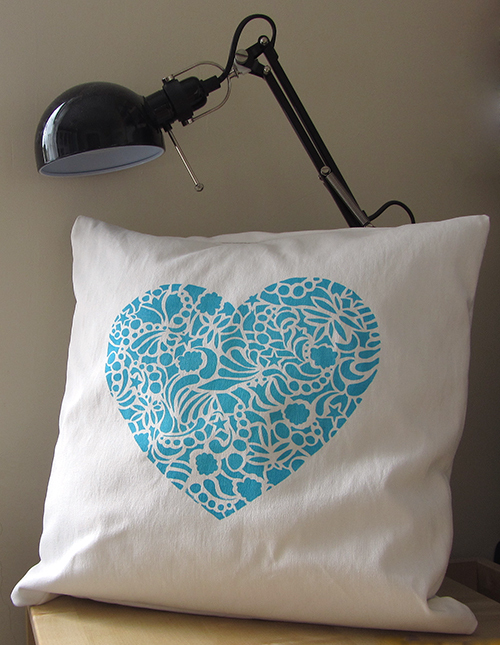 Your cushion is really adorable – I love the fact it’s been made up with different shapes.